I had been dreaming of Raan recently. 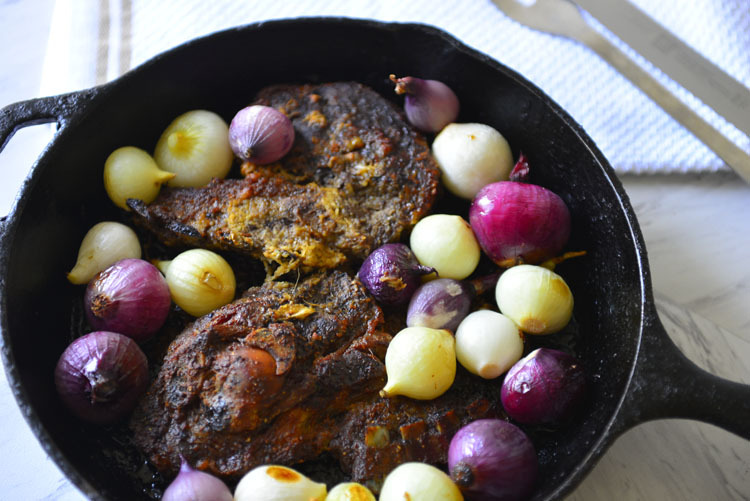 Raan is a roast bone in leg of lamb marinated in aromatic spices. The meat is is fall of the bone tender, and fragrant. Honestly I am not a big fan of lamb, but these recipes are so delicious that the temptation to try it becomes very hard to ignore. A few mouthfuls .. until the craving strikes in another year or so:-) . My family on the other hand loves lamb, be it curried, grilled or roasted. So yes we do end up cooking lamb more than once a year ! The bone in leg of lamb is not something that I can find in the stores here where as lamb chops are much easier to come by.When I found a few lamb shoulder chops – my grocery store here calls it o-bone chops – the other day , I decided to go for it. These were perfect for a simple roast lamb dinner for two ! 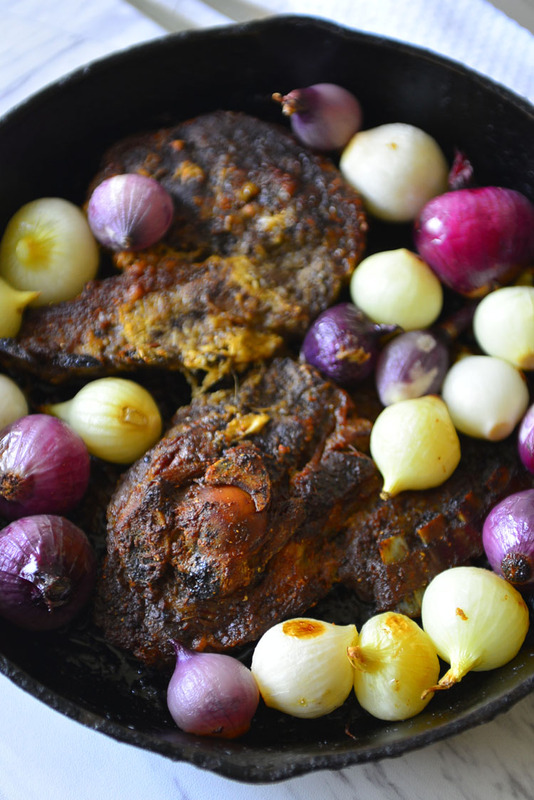 The traditional Raan recipe is very time consuming as it calls for the leg of lamb. Long marination is required to make the meat tender, often the lamb is marinated overnight. Shoulder chops are much more tender and thinner, making 30 minutes enough for magic of marinade to happen. 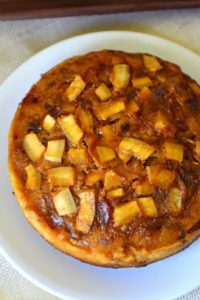 Another point in its favor is that it takes much less cook time, making it perfect for week night meals. You could plan ahead, marinate the lamb and place covered in the fridge to be cooked in the evening. Lamb is a naturally flavorful meat. A touch of spices is all it needs. I have added a little garam masala , cumin , ginger , garlic and yogurt. If you like it spicy add more pepper or cayenne. An oven safe skillet is the pan for this dish, brown the meat on the stove top and transfer to the oven all in the same dish. My trusty cast iron skillet does this job the best ! The cast iron is very good at retaining heat. While the oven is preheating, you can heat the skillet and brown the meat. Couple minutes on each side is all it needs. Once it is browned on both sides pour the remaining marinade mixed with a little water over the lamb. Turn off the heat a cover and transfer the pan to the oven. Let it cook for about 20 minutes . In the same trip to the grocery store , I found a bag of mixed pearl onions- purple, yellow and white. We love pearl onions and pickled vinegar onions are often found on our dinner table. These were very reasonably priced and I couldn’t let it pass. 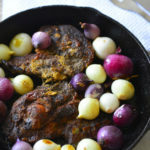 These colorful onions were the perfect accompaniment for the lamb . You could use other vegetable as well – turnips, potatoes and carrots are all good options. Uncover and add the onions. Alternately you could add the vegetables as the lamb goes into the oven. If you were using large vegetables that is what I would have done. Roast for an additional 20 minutes. Remove from the oven and let it rest covered for 10 minutes before serving . Doesn’t that look inviting! I served these with a side salad of carrot and cucumber ribbons. You could make it into a one pot meal for two by adding a mix of vegetables along with the lamb like – potatoes, carrots, mushrooms and turnips. Another option is to double the marinade and let it become a nice sauce, and serve the lamb along with few naan breads or Kulcha. Serve with a side salad , a piece of bread or some potatoes. Looking for a special dinner to make for 2 on a weeknight ? This might be it. This roast lamb does not require much hands on cooking time. The flavors are lovely. 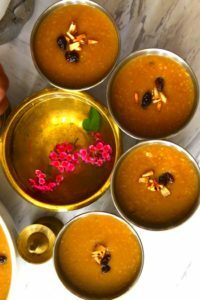 I love to serve this with pearl onions , but it taste wonderful with almost any root vegetable. Mix all the ingredients for the marinade. Taste and adjust salt - the marinate should feel salty. Make a few tiny slashes into the meat and rub the marinade all over. Cover and set aside for 30 minutes. Pre-heat the oven to 350°F (175°C). While the oven is preheating take an oven safe skillet and heat over medium heat. Add the oil to the pan when hot . 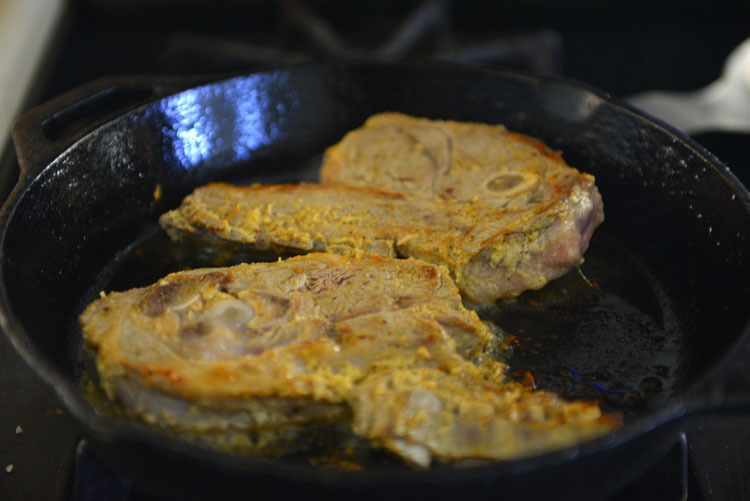 Rub the marinate off the lamb chops and place them on the hot skillet. Do not discard the remaining marinade. Brown for 2 minutes. Flip the chops and cook for another minute. Add 1/2 C water to the remaining marinade and mix well. Pour over the lamb chops evenly. Loosely cover the skillet with an aluminium foil and transfer to the oven. Cook for 20 minutes. Skin the pearl onions. Remove the skillet from the oven and add the onions. Do not cover and return to the oven . Cook for another 20 to 25 minutes remove from the oven and cover and let it rest for at least 10 minutes before serving . The recipe here creates a well done roast lamb assuming about 1 inch thick cuts. The internal temperature should be 145°F for rare 160°F for medium and 170°F for well done. Add Cayenne to the marinade for a spicier version. 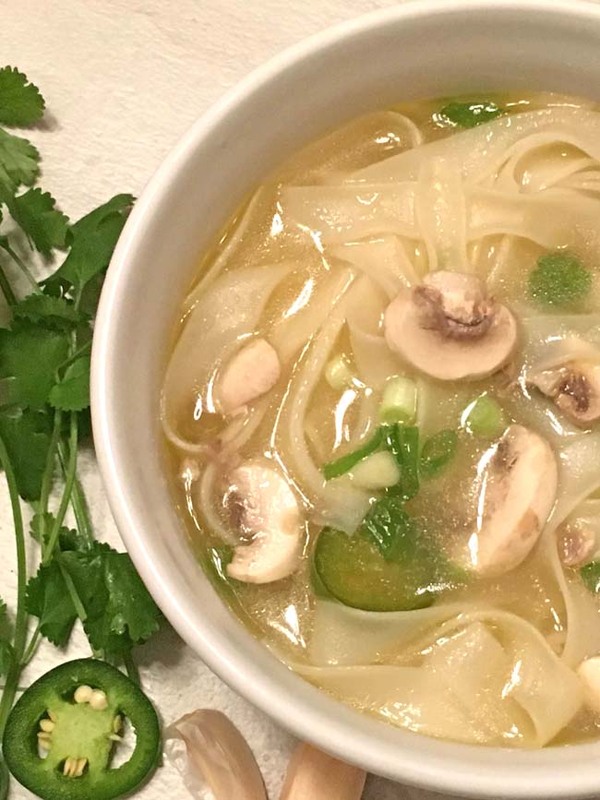 Hello , This has become our favorite meal for 2 ! We have made it a few times so a fat and it turned out great every time !! !